Today I went shopping with my brother & Mr Peck and got a really cute top that I can wear with tights. Been looking for something like this for a while and happy I found this one. Got it on special for $30! Sweeeet! I'll have to do an outfit post later this week... Later we watched the latest Pirates which was actually pretty good I thought! Few odd bits in it, like the freaky mermaids... what the?! But yeah, I enjoyed it! 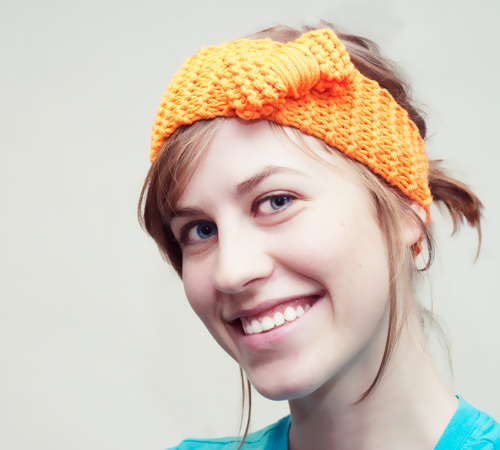 For my creation today I decided to knit me a head band out of this lovely orange wool that I bought for my yarnbombing. I got a few bags of wool from the op shop for like $2 and this one was in there. Pretty cool, it's chunky and an awesome colour. I knitted this up on size 8 needles in simple garter stitch and it was so so quick! And would be a great first project if you are just learning knitting. Let me know if you want me to tell you more! I am sorry for the slightly scary picture. Sleep has been avoiding me, or maybe I it and my eyes are pretty crazy.... like red & baggy and stuff... plus I don't have makeup on so yeah. Photoshop Alert!! But just ignore me and look at the headband ok? Thanks. I've been wanting to learn how to knit, and this would be the perfect winter accessory! If you have more detailed instructions I'd love to give this project a try!